Iran is in possession of improved and dangerous weapons systems that give Tehran the ability to threaten some of the world’s most important waterways, according to the top American admiral in the Middle East. “They have a growing capability in cruise missiles, they have a growing capability in ballistic missiles, they have a growing capability in unmanned surfaced systems, all these things that we watch that are offensive, and destabilizing in nature,” Vice Adm. James Malloy, the commander of US Naval Forces Central Command, told a small of group of reporters in Bahrain on Wednesday. Unmanned surface systems, which can include explosive boats designed to target enemy vessels, have concerned US officials for some time, particularly after Iranian-backed Houthi rebels based in Yemen used such a boat to attack a vessel that belonged to Saudi Arabia. The US has accused Tehran of supplying the Houthis with these boats. Iran’s military also possesses advanced sea mines, including acoustic and magnetic variants, a US defense official tells CNN, weapons that could pose major risks to maritime traffic. Additionally, Russia’s sale of advanced air defense systems to Iran, including the S-300 missile system, has sparked growing concern that within five years the US will have to fundamentally change how it operates in the region’s critical waterways, according to a senior US military official. The official said the new air defenses are just one aspect of a changing security environment that could result in traditional ports being not readily accessible due to Iranian missiles and mines. The US assesses that Iran is in the early stages of deploying the S-300 system. 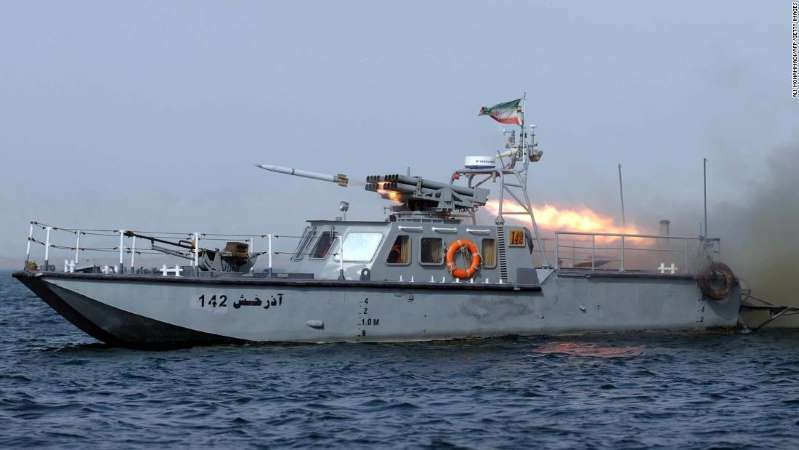 Iran’s increased ability to threaten ships in the region comes as some military officials have expressed concerns about some of the more strident anti-Iran posturing being undertaken by hardline members of President Donald Trump’s National Security Council. In a White House video message on Monday, national security adviser John Bolton warned Iran over its threats. “So Ayatollah Khamenei, for all your boasts, for all your threats to the life of the American President, you are responsible for terrorizing your own people and terrorizing the world as a whole. I don’t think you will have many more anniversaries to enjoy,” he said. The senior military official said the military is seeking to avoid open conflict with Iran and rely instead on economic and diplomatic pressure. However, military commanders believe Bolton is more strident and has a “proclivity” for action in the Gulf, the official said. US intelligence officials offered a similar analysis, telling CNN that Qasem Soleimani, the commander of Iran’s expeditionary Islamic Revolutionary Guards Quds Force, which has been linked to operations in Syria and Yemen, “knows just how far he can go” without upsetting the civilian and clerical leadership in Tehran. “He too is being careful right now,” the officials added. The maritime area where Iran operates includes the Strait of Hormuz, linking the Persian Gulf to the Arabian Sea, which has been labeled “the world’s most important oil transit chokepoint,” according to the US Energy Information Administration, with 20% of the oil traded worldwide moving through the waterway. At its narrowest point, the strait is only about 30 miles wide. But despite Tehran’s increasing capabilities, Malloy said he was confident in the US Navy’s ability to counter any Iranian threat. “I look at our capabilities — both US capabilities here and the capabilities that the coalition brings to the fight — and I compare and contrast with what our capabilities are to theirs, and I don’t worry. I prepare and I’m prudent and I’m cautious. But I think worrying would be a strong word — I’m pretty confident with our capabilities,” he said, noting that the US has 21 ships permanently assigned to the region, including patrol craft, minesweepers and Coast Guard ships as well as locally based ships from allied countries such as the UK.